On it rumbles, with a very real sense of making it up as it goes along. Mainly, I think, because it is. Part of the anathema of American Horror Story is that it’s a live experiment. Not all of the things it tries out work — no experiment is ever 100% successful — but it always seems to come across some interesting nuggets. It’s a commitment to watch, in a way, because you never really know what it’s after a lot of the time. The previous four seasons have all, to varying degrees, pulled it together by the end, and are more notable for their successes than their failures. And that, ultimately, is the bar that Hotel has to meet. I’m getting so badly behind on these, it’s really not funny. I can’t even blame it on the fact that I’m not enjoying the series, because on balance I am. It had a shaky start, but is getting its act together bit by sorry bit. Most of it comes down to knowing where it’s going. Once it’s got that down, characters have a defined area to run around in, and themes can begin to emerge. Without that, you’ve just got a collection of horror tropes in a grab bag. Given that Halloween fell between two episodes of Hotel, it makes sense that two episodes would have a Halloween theme. The first of them was actually pretty good, blocking out some of the noise of the extraneous storylines. They will presumably need to be revisited this time around, but that’s okay because it finally feels like the series has some clue where it’s going. Part of American Horror Story‘s unique charm — not limited to Hotel — is that they start filming before they’ve actually finished writing it. So when it seems a bit lost, it sort of is. But then again, that’s what makes it one of the most interesting shows on TV. There is a proud tradition of American Horror Story Halloween episodes, right from Murder House. It make sense that this is the time that the series pulls out its A-grade material, drawing on the Halloween culture. So what does Hotel have to offer? Hopefully, a little cohesion. It would be churlish to deny that things have been improving since a rather flat and lacklustre opening episode, but we’re still a long way behind the expectations that four preceding series have set. If the first episode of American Horror Story Hotel felt flat, which it did, then the second at least felt a bit more like the series we know and love. There were always going to be a few teething pains this time around, really. Though the anthology nature of the show allows a world of inter-season flexibility, Jessica Lange had established herself as the mainstay from the very first outing. Finding a rhythm that works without her was always going to be a tough challenge. Thusfar I don’t see Lady Gaga as her replacement. That’s not to say that she’s doing a bad job, far from it, but she doesn’t yet have the confidence to carry the series on her own. In that respect we’re going to need a greater sharing of the weight amongst the stellar and experienced cast. Which isn’t a problem, it’s just that the writers need to start giving them the chance to do so. American Horror Story is all about the big bang. Not necessarily loud, but it should hit you in the gut like a sledgehammer. It’s not altogether encouraging, then, that the opening episode of Hotel felt a little…weak. The pieces were all there, particularly the aesthetics, which I have to say showed an attention to detail. But there was little in the way of overarching plot linking it together. Really, it felt like a lot of glamorous and good-looking people simply moving around in front of some amazing sets. And that is just not what American Horror Story is about. True enough, it has those facets. It uses them for dramatic effect and to dress the window, but the importance is that window reflecting onto the darknesses of the human soul. The second episode remembering that fact would be very welcome. As a review, I suppose this is a bit on the late side, given that the book actually came out back in March. But with coincidence and life conspiring against me, I’ve only just finished it. So here you are. First off, Thirteen Years Later is a sequel to Twelve. And both of these books are that most bemoaned of things, vampire novels. But fear not, gentle reader! In respect of tradition, the main character spends both novels trying to kill said undead nasties, rather than trying th shag them, which (odd as it sounds to actually say it) is a breath of fresh air in this subgenre. And the particular original selling point of these books, are that they are set in nineteenth century Russia. Now, I really enjoyed Twelve ( and I highly suggest that you read it before trying to get into Thirteen Years Later), but when I started on Thirteen Years Later I found it a bit tough going. Unlike its predecessor, it is written in third person, and from multiple viewpoints, which takes a little getting used to, and doesn’t leave the reader feeling quite as connected to now-Colonel Danilov. Also, it begins with a scene whose meaning only becomes apparent later on, which is a little off-putting as well as confusing for a beginning. But by a chapter or two into the book, I was hooked. The characters are a combination of some of the survivors from the first book (changed and matured over the intervening thirteen years, both naturally and realistically), as well as engagingly written newcomers. And the fact that I devoured this book in less than four (not un-busy) days should show precisely how well it sucked me in. Kent is a very good writer. He doesn’t have the technical flair of the literary writers who win the pretentious awards by the truckload (and see my In Defence of Genre entry for why that is absolutely not a criticism), but he is very good at what he does. Both of his novels have grabbed me, and kept me hooked until the very end, and to my mind that is how a good novel should be. And the research that has clearly gone into this is staggering.As a reader, I felt I was right there in St. Petersburg, Moscow, or any of the other locations. Kent knows well both his Russian history and geography. In terms of criticism, there’s not much to say. Aside from the aforementioned perspective issue, which really wasn’t much of an issue, the only part that seemed to me not to fit was that Aleksandr seems at some point in the second half and for some reason, of which I could discern neither, to change his opinions and motivations as to the future of Russian government. But overall, Thirteen Years Later was a triumph; fast-paced, engaging, slick, and very smart. I thought that it excelled in particular with the contrasts between vampire and human, and how vast (or not) is the difference between man and monster, and also with eh evolution of moral themes from Twelve. Kent considers just how evil these creatures are, and even evokes sympathy for them at times. And all this without them standing around brooding, or anyone trying to shag them. 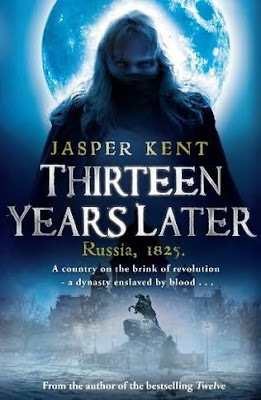 And since this is only the second novel in a planned series of five, I think that it’s safe to say that the themes of Romanov blood, betrayal, and revolution will be making returns in subsequent novels, as Kent takes his readers through a tour of Russian history, decorated with vampires and cunning storytelling.